Hey Google, why does my sewage system smell? Have you noticed a bad smell coming from your toilet, bathrooms, drains or septic wastewater sewage system? How did my sewage system get smelly in the first place? Those wine dregs and kitchen grease you pour down the sink? That toilet duck and “little bit of bleach” you used in the bathrooms. That course of antibiotics you’ve been taking? These substances kill off good bacteria and clog up your ATU limiting your sewage systems ability to efficiently break down waste. There are a number of factors that contribute to bad smells and odours in septic sewage systems such as alternative wastewater systems like Aerobic Treatment Units (ATU’s). Aerobic Treatment Units rely on a healthy bacterial flora to assist in efficiently breaking down waste. This bacteria is harmed and can be destroyed completely by inputs such as prescription medicine use and harsh chemicals used in cleaning. It’s really important that you monitor what’s going down your drains and dispose of substances that are harmful to the ATU in other ways. Download our free list of Absolute Do’s and Don’ts for a Healthy ATU here. If your using a lot of water over a short period in showers, baths or laundry, this can result in too much water entering the ATU at once and not allow sufficient residence time in the main chamber of the ATU. Also if the solids tank of your system is quite full it takes up space that effluent would normally be digesting in and this can lead to effluent being under processed due to lesser residence time. Sometimes stagnant water can sit in pipes that aren’t regularly flushed or a buildup of soap scum, non-biodegradable objects (toys, sanitary products etc), kitchen grease or stale air in drains can cause a bad odour. Visit the Water Corporations What not to flush page While you are not connected to mains sewage, the same principles of caring about what goes down the drains apply. Your toilet is no place for the disposal of cotton buds or “flushable” wipes. We recommend applying the advice of the Water Corporation to your Aerobic Treatment Unit. 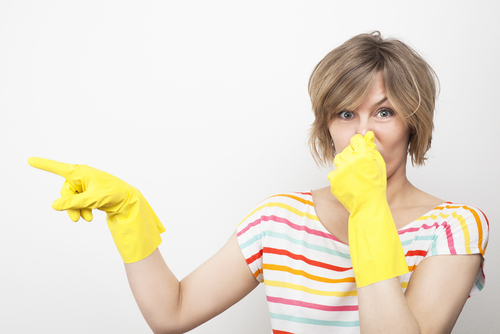 What happens if I ignore bad smells? A bad smell in your wastewater treatment system can often be the cause of something seriously wrong. Left untreated, waste is not able to break down efficiently. At its worst (and yes, we’ve seen this happen) this build up may result in unprocessed sewage overflowing onto your property straight from the ATU and effluent coming back up your drains and toilet and overflowing into your home - you’ll be faced with not only a messy cleanup job, but emergency callout fees, the possibility of a Total System Evacuation (pump out) and an unplanned for bill for repairs. Be proactive. Start using Ecocare Activator and our approved range cleaning products and papers to bring balance back to the system. Stop using bleach and harsh chemical cleaners today. Wipe the grease off cooking pans and plates before they go in the dishwasher. Want to know more about proactive steps to a healthier ATU? Talk to our friendly Support Team on 08 9248 9440 today! *This promotion is open to current customers with a valid Maintenance Agreement in place.